Unfortunately (or fortunately, because of the outcome) I was unable to watch the entire Bears/Falcons game yesterday. See, when you go to school in a college town 333 miles south of downtown Chicago, your cable provide pipes in the feed from southeast Missouri. Needless to say, fans of a football team north of Illinois' Mason-Dixon line aren't pleased. 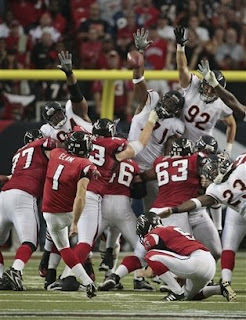 Anyway, since that is the case, I (and several of my newsroom buddies) were treated to Jason Elam kicking Bears fans in the collective groins with a 48-yard game-winning field goal. Don't get me wrong, Lovie Smith still gets a lot of my wrath because of the squib kick, not being able to score from one yard out and for keeping Ron Turner employed. However, he gets a little less blame this afternoon. Just a little bit, not a lot. "There appears to be a buzz amongst some Bears fans regarding the closing seconds in Sunday’s 22-20 loss to Atlanta. When Matt Ryan drops back to pass what would be a 26-yard completion to Michael Jenkins, there are six seconds remaining in the game. The only problem is the clock doesn’t start ticking until after Ryan is nearly fully set in his stance. And it’s a seven-step drop. Considering Jenkins is ruled out of bounds with one second left, the implications of a late-starting clock are obviously HUGE. In this case, one second is the difference between winning and losing. But then again, it probably never should have been this close in the first place." As much as I want to point that out as a reason the Bears lost, there are other reasons. These all fall on the head coach. And Lovie's good, but sometimes I think there's a better option. His name is Bill Cowher and he's working for CBS. I guess we're stuck at 3-3, for now.